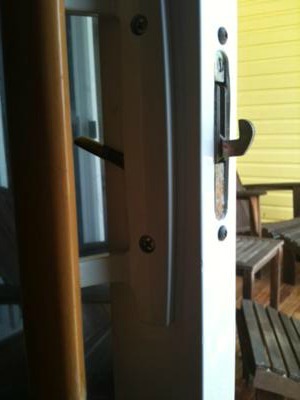 Patio Door Handles - Do you have a broken handle or lock ? Patio door handles come in a wide variety of shapes and sizes but fortunately the mounting dimensions are the same among many different kinds of locks. This means you can often replace a handle with one that may look different but has the same screw mounting pattern. So long as the handle does not interfere with other parts of the door, you can use it. Manufacturers have made "universal" types of patio door handles which replace all sorts of old handles and locks. But you still need to figure out which type of universal handle you may need. Surface mount locks typically are screwed onto the face of the patio slider frame. The lock is built into the handle. The picture above shows an 070001 model lock. The newer versions have the same handle on both sides. These are the easiest to replace because most of the time you just have to pull out 2 screws, remove the old handleset and bolt on a new one. The bolts or screws that hold the locks on are often 6-5/8" or 168mm apart. So any handle the has that hole spacing will bolt right on. Even if the spacing is different, you usually only have to drill one new hole in the door and at worst fill one of the old screw holes. 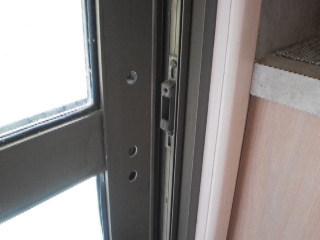 I have more information on these type of sliding glass door hardware on my surface mount locks page. If you have a dimension other than 6-5/8", you still might be able to find another lock but it may not be worth getting an exact replacement. If no one stocks the lock with the dimensions you have, consider drilling new holes and putting on an easily available 6-5/8" lock. This is easy when its a wooden patio panel but you may need to get creative to hide the old mounting holes in an aluminum or vinyl patio slider. One way to cover the old hole is to use "Bondo" or automotive body filler. Another way is to make a thin flat plate from white aluminum sheet stock. Then use the sheet in beteen the lock handle and the door to hide any old holes. Mortised locks fit right into the frame of the door. On a wooden patio panel a pocket is milled out of the sliding panel frame and a mortise lock is slid in. The handleset is installed and the lock actuator rod is slid through a hole in the frame into a hole in the seperate mortise lock. The handles and locks are seperate. For handle information check out this page. My page on mortise locks deals with the different kinds of seperate locks used with this style of handle. On an aluminum patio such as the picture above the mortise lock usually is screwed to the door top and bottom. Again the handleset is installed first by inserting the actuator rod through the frame and into the lock. Once you have the broken mortise lock removed you need to take a few quick measurements so you can source the manufacturer of the lock. 1. Width of the lock. 2. End Face Plate type(round or square). Inset style locksets are really popular in aluminum sliding doors. With this type of lock the lock and the handle are combined into one unit. A tall rectangular holes is cut right through the patio door and each half of the inset lock gets installed so the patio door is sandwiched in the middle. My page on inset style locksets goes into more detail with information about the different styles and accessories that go along with these locks. In addition to patio door handles handles there are other bits and pieces that often need replacing on patio doors. The fix clips that hold the panels in place often get broken or get lost. You also might want to add or replace a keylock on the outside so you can open your patio door with a door key. If you are not sure a universal handle will fit your door, take a picture of the handle and lock with your digital camera, and submit it in the form down below. This can be really helpful when trying to communicate which kind of lock you are looking for help with. Not only that, others will be able to see your pictures and be get help for their own lock and handle repair problems. Hey Screen King - I thought you might have some thoughts on this one. While prepping my screen door, I drilled the holes for the handle on the wrong side (my mistake for listening to a friend who didn't realize how the door was going to go). Anyway, Anderson says they don't have a blank beauty plate (which i was going to use to hide the holes drilled on the wrong side). 2) Fill in the whole and paint over (i'm not sure what to use for fill nor do I trust that the paint will match. I would cover the holes up with another handle. Alternatively you could purchase a roll of Aluminum from Lowes or Home Depot and cut a white rectangle to cover the holes. Just glue it on. I need locking inside and outside handles to fit the mechanism shown attached. Can I find these at a lumber yard? Do you have them to sell? I uploaded a picture of a handle assembly for this sliding patio door mortise lock, the handle in the picture comes with a keyed lock and is available without the lock. Price is $32.00 for the unkeyed handle. Delivery time 2-3 weeks. Let me know if you need one and I will send PayPal invoice. I would like to install inside-mount Roman shades over my double patio doors. However, the handle on the inside lock projects several inches and towards the middle of the doors. The shades will not lay flat against the doors and are crooked because the handle sticks out so far. Do you have a flush-mount, or very low profile handle for interior use (perhaps similar to the typical outside handle for a screen or patio slider) that still has a locking mechanism? The shades cannot be installed on the outside of the doors but must be installed inside-mount. Even if they could be installed on the outside of the trim, the handle still projects beyond the trim and the shades would not lay flat installed that way either. The current handle cannot be turned around to face the other direction towards the trim because then your hand cannot fit between the trim and the handle to open the door. If you have any pictures of the existing lock, that would help a lot. There are flush mount handles, but mounting them depends on the type of panel you have. I am looking for a handle for a patio slider that mates with the lock E2012 image from your site.would you have one to match the color of my patio panels. 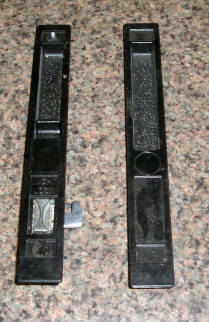 Both the C1128 and the C1019 will work with E2012 mortise lock. You can find pictures on the patio handles page. 2 months of aggravation and wasted money. No one at Home Depot or Lowes know anything about handles or door locks. Just look at the re-taped Wright hardware on their shelves and you will see how many other people put stock into the knowledge they do not have, me included. Now I have the (finally) 3 and 15/16 mortise but need the door handles. They were originally white, and broke. They had an exterior key lock, and inside latch to lock the door. If anyone knows who sells the product please let me know. Would like to also change the rollers, but cant get the door oout of the track. I could live with that but the handles are driving me nuts and cuckoo. Hi Frank; Give me a call at 1-866-904-2383, I have handles and I am sure we can get the proper handle set for your lock. My sliding glass patio door, installed 20+ years ago, is in need of a replacement door lock. I have been unsuccessful in finding any marking on the door that might identify the manufacturer. Looking at the locks that you list, it appears that my lock may be of the Long Flange variety, but the dimension are not exactly the same. The size of the flange in the mortice is 6.06" long and 0.75" wide. The spacing of the the two mounting screws is 4.56". I have attached a couple of pictures. Do you think that you can identify the correct replacement? My renter drilled through the mortise lock on the sliding doors of my house. I have replaced it but now i need a new patio door handles set.The holes are 3 and 15/16 on center with latch type hook that moves up. The problem is I have purchased two patio door handles from home depot and the screws are too long and bind before it gets tight. Its as if the slider panel is too thin for the length of screw. What do I do? I have already spent at least 50 bucks in parts and gas. The manufacturer appears to be Guardian from Corsicana, Texas. I am trying to not order more handles online without knowing if they will work. It sounds to me that you only need to shorten the mounting screws for the patio door handles you have already purchased. Even if the original supplier of the sold you a new handle. I would bet the screws would be still too long. Most window manufacturers do not make their own handles. They buy in from a company that specializes in just handles. I would just clamp the end of the screw in a vise and cut 1/4" off the length at a time until I got the length right. You can usually estimate how much to cut off by installing the screw until it bottoms out, then hold the handle set in position and measure how much the head of the screw sticks out from the the handle or housing. You can cut the screw with a hacksaw and then use a file to smooth out the rough cut edges. That will make the the screw engage more easily. Do not cut the screw with wire cutters, it might work but the threads will get damaged. You might also be able to find pre-made screws at Lowes or Home Depot. They are usually available in 1/4" steps. When I am doing repair I keep a supply of different length screws because the problem you describe is pretty common. Even with a whole case of them, I still find that there are sizes that I dont have ! With storm doors they even supply screws that are designed to break off every 1/4" with pliers. You might even be able to find those screws at the hardware store too. Just make sure you get the same head style and thread as what you already have. I am looking for a replacement handle for my patio sliding glass, the one pictured on your site looks like it matches it exactly, but I can't find the order information for it. I will attach the photo of the one like mine, if it is available for ordering please let me know. If it is not available from you directly and you know where I might get one please let me know that also. Thank You!! I have the inside locking handle and the mortise lock 3-11/16 is still in place, but the outside pull with the key cylinder was damaged during a previous hurricane. does any key cylinder work with a 45 degree keyway on the lock? Once the is in the lock the cylinder will spin 360 degrees, it does not matter if the keyway is 45 degrees or 90 degrees. The mortise lock itself is the only thing that stops the lock cylinder turning. Its not too sophisticated, its designed to work with just about any style of mortise lock so long as the shaft sticking out the back of the lock fits in the mortise lock keyway. Is it possible to get a patio / slider lock that opens from the outside?! its seems like no one has ever thought of this before. am i mad to want one?! And if they dont exist is there a way to leave the main lock open but attach at secondary lock that i can lock from the outside and take the shot cut into town from my back garden? Yes many patio slider locks can be fitted with a key cylinder so they can be opened and closed from the outside. In many models, the handle assembly is made so that all that is necessary is to punch out a small disc and then install the proper lock cylinder.